Trim the ends from the delicata squash. Cut the squash in half lengthwise and scoop out the seeds with a spoon, then cut each half crosswise into ¼-inch-thick half-moons. Peel the onion and cut in half lengthwise, then crosswise into ¼-inch-thick slices. Remove the stems and seeds from the mini sweet peppers; cut the peppers lengthwise into ¼-inch-wide strips. In a large frying pan over medium-high heat, warm 1 to 2 tablespoons [2 to 3 TBL] oil until hot but not smoking. Add the squash and cook, stirring occasionally, until starting to soften, 4 to 6 minutes. Add the onion, peppers, and ¼ cup [½ cup] water, season with salt and pepper, and cook, stirring occasionally, until the vegetables are just tender, 3 to 4 minutes. Transfer to a plate and season to taste with salt and pepper. Wipe out the pan if using to heat the tortillas. While the vegetables cook, start preparing the salsa, garnishes, and tortillas. Cut the avocado in half lengthwise. Remove the pit, scoop out the flesh, and cut the flesh into ¼-inch-thick slices. In a medium bowl, stir together the tomatoes, lime juice, half the cilantro, and 1 to 2 teaspoons oil. Season to taste with salt and pepper. On the stovetop directly over a flame, or in the same pan used for the vegetables over medium heat, warm the tortillas, turning once, until just pliable and warmed through, about 30 seconds per side. Transfer to a clean kitchen towel, cover, and keep warm. Set out the tortillas, vegetables, tomato salsa, lime wedges, avocado, queso fresco, and remaining cilantro. Invite everyone to assemble their own fajitas. Scoop out the squash seeds. 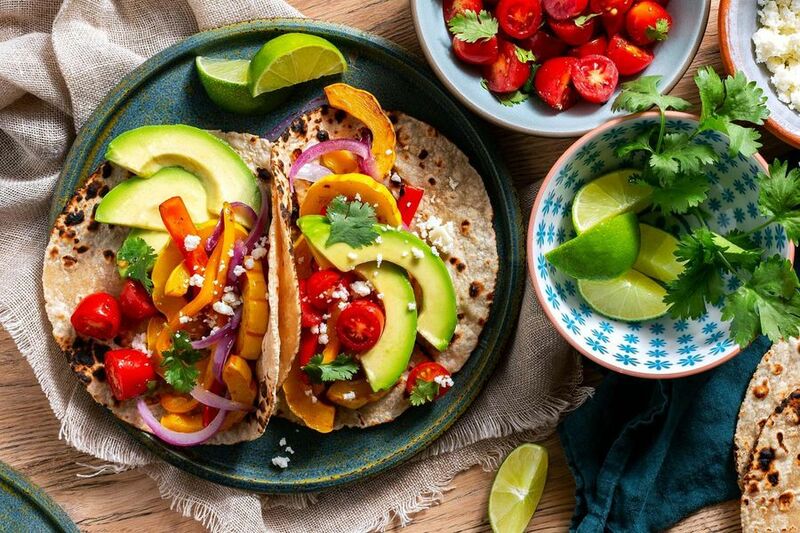 Delicata squash, sweet peppers, and onion, some of fall’s finest flavors, are wrapped in warm tortillas with all the fresh fixings for a quick and easy weeknight meal. It took seven years for 16th-century Franciscan friar Bernardino de Sahagún, “the first anthropologist,” to finish the most complete documentation of the Aztec diet, which cited corn, tamales, chiles, and tortillas among the staples. In Nahuatl (the language of the Aztecs), tortillas were called tlaxalli, meaning “corn bread,” and were made daily for most meals. Calories: 780, Protein: 26g (52% DV), Fiber: 23g (92% DV), Total Fat: 35g (54% DV), Monounsaturated Fat: 18g, Polyunsaturated Fat: 3g, Saturated Fat: 9g (45% DV), Cholesterol: 30mg (10% DV), Sodium: 1040mg (43% DV), Carbohydrates: 96g (32% DV), Total Sugars: 17g, Added Sugars: 0g (0% DV).